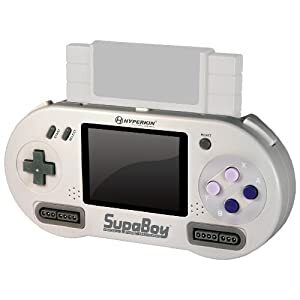 Hyperkin has released a portable SNES console to the masses! This is awesome for all those retro gamers out there like myself it is available on Amazon and the reviews seem pretty optimistic. Features include the ability to play both original SNES carts and Super Famicom carts as well. The battery life is about 2.5 hours and the battery is changeable. Also included is the ability to plug into your tv and connect two controllers. The Super Gameboy works in this as well I believe. Screen is really big and the entire unit is little large for a handheld (feels almost like a Lynx but slightly less weight).